Widespread EV adoption not expected before 2025. Automotive executives are pouring tens of billions of dollars into vehicle electrification, but the most important advancements in automotive technology will come from engineering and technological advancements made with internal combustion engines. That is one of the findings shared in the 14th Annual Global Automotive Executive Survey conducted by KPMG LLP, the U.S. audit, tax and advisory enterprise, and released this month. The annual survey of more than 200 C-level auto industry executives (i.e., CEOs, COOs, CFOs and the like) found that 26 percent said that their companies will invest resources to shrink the footprint of their internal combustion engines while optimizing performance. Some 36 percent of executives acknowledged that most of their research and development costs will target ICE development, while 71 percent stated that improvements in ICE engineering and technologies will bring forth more efficiencies and reduced emissions potential than investing in EV technologies, at least over the next six to 10 years. 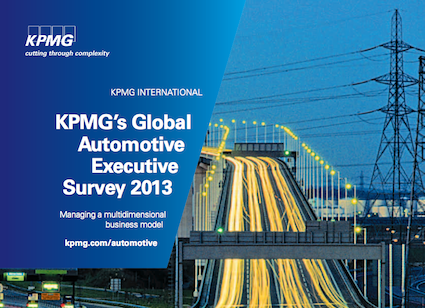 Still, the KPMG survey did reveal that ICE investment is not coming at the expense of alternative drivetrains. Noted Gary Silberg, the National Automotive Industry leader for KMPG, manufacturers will continue to …intensify investment in electric technology, fully appreciating what is at stake in a very competitive industry. Indeed, 26 percent of executives stated that their companies will invest chiefly in plug-in hybrid fuel systems over the next five years with 17 percent stating that hybrid fuel systems will get the nod. For the same period, 13 percent said that the main investment will be in battery electric vehicle technology with range extender, 11 percent with fuel cell electric vehicles and 8 percent with pure battery electric vehicles. Not surprisingly, some 87 percent of executives believe that BEVs will not be able to match the range of gasoline- and diesel-powered vehicles for at least five more years. Most also believe that vehicle electrification gains over the coming years will come from systems that are not purely BEVs including PHEV, HEV and FCEV models. Automotive executives do not expect that the entire spectrum of EVs will top 15 percent of new car sales in 2025, although the surveyed U.S. executives seemed more optimistic than their global companions, with 45 percent expecting the EV adoption rate to come in at 16 percent or higher for vehicle registrations. The 64-page KPMG survey delved into other areas of the industry tackling such issues as urbanization, globalization, customer behavior, capacity and global dominance. The four BRIC countries Brazil, Russia, India and China are expected to account for nearly 1 in 2 new vehicle sales by 2018, representing more than 40 million units for those countries alone. Despite the growth, a key concern remains capacity, a problem that is most apparent in Japan and across much of Europe. Yet, 21 percent of European and Japanese executives believe that overcapacity in those markets can be solved by exporting more vehicles. Most executives believe that todays overcapacity issues will be reduced over the next five years. Besides the BRIC quartet, the survey revealed that there are four more nations with much potential for growth: Malaysia, Indonesia, Mexico and South Africa. Mexico, for example, continues to add capacity as this country along with the three others offer lower labor costs than found in mature markets. Ask any executive about industry growth and you will find that market share is always a big concern. Every executive desires more sales, but that does not mean that market share will increase with it especially as the industry pie expands. If the KPMG survey is a good indicator of future auto trends, only Volkswagen and BMW stand the best chance among Western car manufacturers in gaining market share. A full 81 percent of executives believe that VW will continue to increase its share while just 3 percent believe that its share of the pie will shrink. BMW and Chinese car manufacturer BAIC were tied for second with 70 percent of executives expecting these companies to gain market share with just 5 percent expecting them to drop. Toyota, Hyundai/Kia, SAIC, FAW, Geely, Nissan and Tata rounded out the top 10, with at least 50 percent of the executives expecting these companies to gain market share. While Ford, GM and Chrysler may fare rather well, the latter thanks to its partnership with Fiat, there are some car manufacturers that may struggle. Notably, four Japanese car companies Suzuki, Mazda, Mitsubishi and Subaru offer the least confidence among executives. In each case, more executives predicted that the bottom four would retain or lose market share, accounting for more than those believing that each would see an increase. Clearly, the automotive market will continue with its rapid-fire changes. More efficient vehicles are coming and emerging markets will continue to shape what car manufacturers build. Smaller manufacturers will most likely be acquired or forge strong relationships with industry leaders in a bid to survive. See Also — What Makes Today’s Internal Combustion Engines More Efficient?